Dr. Radhika is a specialist in Reproductive medicine and subfertility with over 16 years of post MD experience in this field. Following her MD in Manipal Academy of Higher Education, she underwent her professional training in the UK in the prestigious North West Deanery. 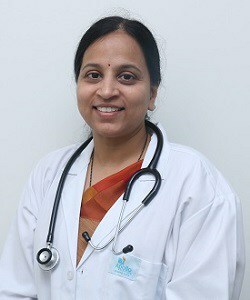 She obtained her MRCOG in 2011 and is a member of the Royal College of Obstetricians and Gynecologists. During this period she has several papers and publications to her credit. She is also an active member of the British Fertility Society. She received advanced training in Subfertility and Reproductive Medicine in the UK. She worked as a consultant in CARE Manchester, the UK this is among the top ten fertility centers in the UK and the top in the North West with excellent success rates. She believes in evidence-based medicine, transparency, and ethics and wants to make the same available in India. She believes in the individualized management of couples. She specializes in all aspects of infertility with a special interest in women with low ovarian reserve, recurrent implantation failure, and recurrent miscarriages, natural cycle /minimal stimulation IVF, PGS, and PGD.